Karna had the knowledge of Brahmastra, but his teacher Parshurama has cursed him that he could not use it when he requires it most. He had kavach and kundal from Sun, which would made him invulnerable, but Indra asked those in alms. But he had given him Vasavi Shakti or Amoghastra, which could be used only once, to him. Karna saved that for Arjuna, but upon the insistence of Duryodhana, he had to use this on Ghatotkacha. 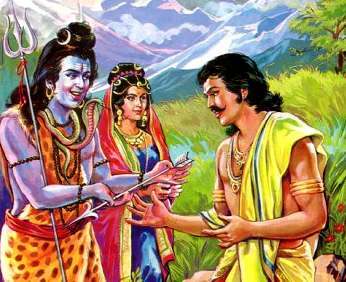 Ghatotkacha was Bheema’s son, who was single handedly decimating the kaurava’s army. He was called by Shri Krishna to fight from his father’s side. Another master stroke from the seventh avatar of lord Vishnu. Arjuna seems to have the blessings of gods when it came to astras and shastras. You name the weapon and he had it. He has done severe penance to obtain divyastras for the battle of Mahabharat. Shiva has bestowed his blessings on Arjuna that his quivers will be inexhaustible. 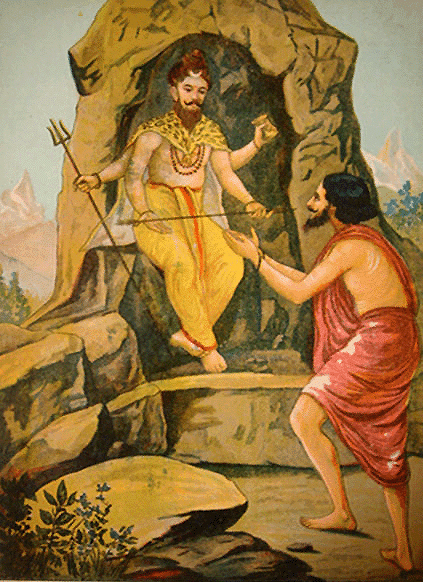 Shiva has also given him the Pashupata, which had the powers to destroy anything. Arjuna also had Yamaraj’s mace, Naagpashas from varuna and Antardhana from Kuber at his disposal. Indra also presented him a weapon before Mahabharat war. Gandiva was also given to him Lord Shiva. These gods have armed Arjuna to fight the evil forces. Arjuna and Shri Krishna are also known as Nara(Arjuna) and Narayana (Shri Krishna). 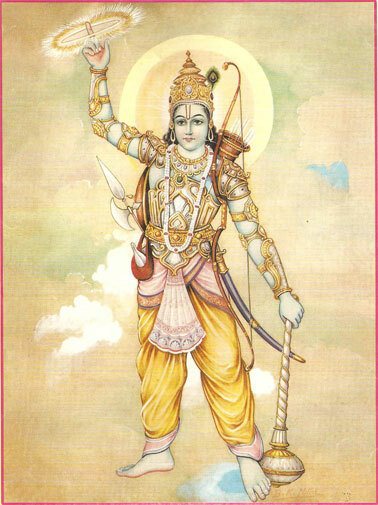 Shri Krishna’s bow was Sharngadhanu, with which he has once countered Shiva’s weapons. He also used Brahmastra to counter a Brahmastra invoked by Shiva. Shri Krishna also had Narayanastra with which he has counterd pashupatastra. When fighting Banasura and Lord Shiva, Shri Krishna used his weapon Narayanjvara to counter Shivajara. No discussion is complete on weapons of Shri Krishna, if we do not mention the Sudarshan Chakra. He used this in the war of Mahabharat for a different purpose – to make sun disappear. This led to killing of Jayadrath. Another notable use of this Sudarshan Chakra was in killing of Shishupala, the king of Chedi, who was also a relative of Shri Krishna. Krishna said(To Arjuna):.I swear by Truth to thee, O friend, that my limbs are burning at the thought that while the son of Subhadra was thus advancing, consuming the hostile army with his shafts, even on that occasion the wicked-souled Karna was engaged in acts of hostility to that hero,Unable, O Partha, to stay in that battle before Abhimanyu’s face, mangled with the shafts of Subhadra’s son, deprived of consciousness, and bathed in blood, Karna drew deep breaths, inflamed with rage. At last, afflicted with arrows, he was obliged to turn his back upon the field. massive and covered with cicatrices. with great lightness of hands. Source:origial mahabharat by vyas..trans by km ganguly! MAHADEV SHIV HIMSELF ACCEPTED ARJUNA SUPERIOTY WHEN LORD SHIVA FOUGHT A DUEL WITH ARJUNA IN HUNTER DISGUISE WHEN ARJUNA DID SEVERE PENANCE ON HIS TWO THUMBS OF HIS FOOT TO OBTAIN PASHUPATASTRA FROM LORD SHIVA..ARJUNA WAS CALLED NARA & HE WAS THE MOST IDEAL MAN HIMSELF & LORD KRISHNA HIMSELF ACCEPTED IN GITA PRAISING HIS MORAL CHARACTER!READ WHAT MAHADEV HAS TO SAY ABOUT ARJUNA..IF YOU WANT I CAN POST ENTIRE NARRATIVE!! #####& EVEN IF FOR ANY REASON YOU WANT TO ARGUE WITH LORD SHIVA REGARDING ARJUNA PROWESS,THEN YOU ARE MOST WELCOME!! Moreover karna himself praised arjuna that everytime he cut thread of bow arjuna in such a speed rejoin his thread that karna cant notice..this is clearly memtioned in karna parva..for god’s sake read carefully..Moreover Arjuna wasnt responsible for karna shaap so why do u blame arjuna..why dont you people dont notice how abhimanyu single handedly hold at bay 5 kaurava generals simultaneously including karna when he was chariotless!! 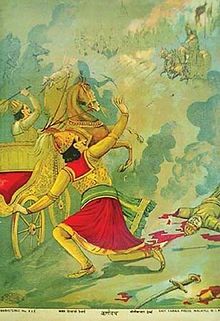 Moreover karna himself said to kunti(in ved vyas version) & to shalya ( in some telugu version) dat anybody except Mahadev Shiva would fear to fight arjuna wid krishna as his charioteer! Moreover about the kavach kundal u claimed of karna better get to know even if shakuni or even blind dhritrashtra had dat kavach kundal nobody not even demigods can penetrate his kavach..the fact of matter is that having impenetrable kavach kundal makes karna invincible in battle & battle will become 1 sided so karna having deprived of his kavach kundal makes the battle equally challenging for both & not 1 sided…So having kavacha kundal will definietly make you invincible in battle but wont show your archery talent! Moreover I laugh at your fact that kunti saved arjuna even though karna only promised he would spare all 4 pandavas except arjuna as karna was determined to kill arjuna even though knowing arjuna was his younger brother..On the other gand arjuna gandiva fell from his hand & he cried for fraticide he had done after karna death after kunti desclosed of karna reality as his elder brother to arjuna & after dat Arjuna developed great affection for karna last suviving son named Vrishaketu, & personally arjuna trained him & took utmost care of him.. This is Arjuna!! Arjuna wasnt even seduced by queen of all apsaras Urvashi whom even great rishis cant resist..Arjuna has an unmatched control of lust & respect for women which draupadi & krishna themselves praised!But what karna did-Karna encouraged cheer haran of draupadi & called drapadi A PROSTITUTE(VAISHYA)..god krishna doesnt like anybody without any reason!! Now coming at your brahmin curse for karna,aruna didnt gave him dat shap so why you blame arjuna..it was his destiny dat even arjuna cant change..in gitaopdesh lord vasudev showed arjuna his vishwaroopam in which karna alongwith all kaurava commanders were engulfed by lord krishna bigg mouth which arjuna saw..everybody knew those on path of adharm are sure to get defeated & stop blaming arjuna for dat! you r wrong again mate…If you read mahabharata properly shikhandi in her previous birth has a boon from lord shiva dat in her next birth as shikhandi,she will be d reason for bhishma death & krishna himeslf enginered bhishma death by arranging shikandi behind arjuna after bhishma himself told d way of his death becoz of shikhandi so u better stop blaiming arjuna for dat..dis was lord shiva boon dat was bound to happen.& according to u arjuna causing bhishma death was unjust..but dear it was again lord shiva boon dat shikandi obtained in her previous birth & dats d truth which ur ego cant change!dis was bound to happenn..then better blame lord shiva & lord krishna both dude..argue with gods then..u can assume however whatever u want in ur own version of mahabharata written by urself!but in actual mb,sorry mate dis doesnt happen dude.. accept dat! Now coming to your point dat karna forgot mantra for brahmastra invocation better read d last part sec 90-91 of karna parva. It was CLEARLY mentioned dat karna after initial struggle karna was able to recall mantra for brahmastra which he invoked & directed at arjuna which was queched by another brahmastra fired by arjuna..
shadevas weapon is sowrd but this sowrd name .